HalloweenBundle - Your digital Halloween Paradise for your Halloween Party! 10 shocking audio horror atmospheres for your party or home haunt to haunt your guests! 23 mysterious music tracks and effects that you can use for your party of haunt! 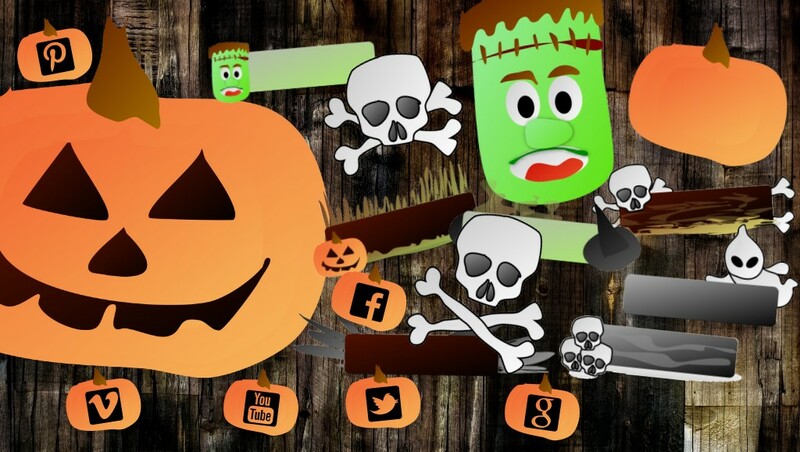 A collection of web graphics for your Halloween website. Mysterious printable document for your Halloween decoration needs - just print it, cut it, use it! Original horror graphics for your Halloween projects and invitations. 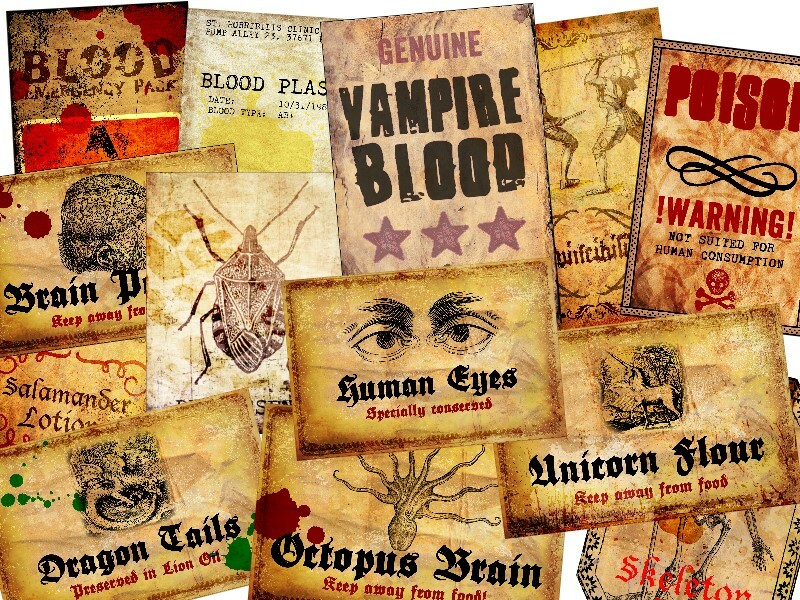 Vintage style scary and mysterious bottle labels for printing - your guests have never seen them before! Project these huge eyes with a projector onto your window or play them on your TV for the ultimate shock effect. 16 new shocking horror atmospheres in MP3 format with even more horrific action! Another 12 shocking atmospheres with new shocking locations & scenes never heard before. 100 original horror sound effects for your own Halloween party effects! 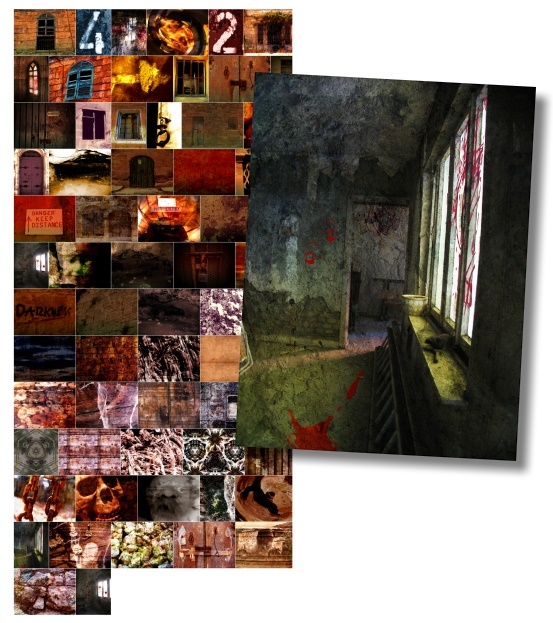 Even more original horror graphics for your Halloween projects and invitations - they look awesome! 33 dark horror backgrounds for your Halloween party or haunt. Preview now! 13 Zombie focused Horror Atmospheres for your Halloween party or haunt. 100 new original horror sound effects for your perfect Halloween party effects! Shocking videos: project a ghost or loop our madhouse camera videos for your party or haunt! Create a real 3D head or loop the videos for your home haunt rules or as a view into forbidden rooms. High quality perfectly vintage bottle labels for your Halloween decoration never available before! All files are licensed for your own private home use only. This excludes usage in videos, music etc. you want to publish or sell. You won't be getting most of the products - are you really sure? Just pay $10 more to get the full bundle! You won't be getting all of the products - are you really sure? Just pay $5 more to get the full bundle! The first volume that started it all! 10 terrifying horror atmospheres for your haunt or party! Get them now and download instantly in HQ MP3 format! Weird and creepy atmospheres that will haunt your guests for the best Halloween party or haunt ever! Be it an egyption theme or a haunted ship or just a creepy haunted mansion - this new volume contains 12 new professional horror atmospheres in HQ MP3 format. Get them now and haunt your guests! Delivered in HQ MP3 format for use in your Halloween home haunt or for your Halloween party in HQ MP3 format. Get them now for the ultimate zombie atmosphere! 89 original horror sound effects including knocks, doors, ghosts, knifes, monsters, water and alien effects - and many more all in HQ MP3 format! 100 original horror and creepy sound effects for your Halloween needs with atmospheres, breaking bones, slicing, cutting, wood, scifi, organ and zombie effects all in HQ MP3 format. All new for 2016! All tracks are delivered in HQ MP3 format. Be it funeral, mad organist, a death cave, a foggy lake or other dark atmospheres - this collection contains it all. Just listen - and imagine hoe you'd use it for your Halloween party. All in HQ MP3 format. Just loop the videos with the horrific eyes on your TV set or use a video projector to get your home some huge shocking eyes! Delivered in MP4 and ISO DVD format to burn onto a DVD. Mad House & Ghost Terror! Just loop our mad house surveillance camera screen on your TV set for your hospital setting or use a video projector to project a ghost or shadow killers onto your window! Awesome! All in Full HD MP4 format. 9 zombie videos that can be looped. Perfect for placing a TV set behind a door with a window so that it looks like you're looking into that room right when a zombie attacks you! New for 2016 - and includes a haunt rules video for use in your Halloween home haunt tp show your guests what is not allowed. We're sure you'll like it! You haven't seen any labels with this quality before (though it depends on the quality of your printer). 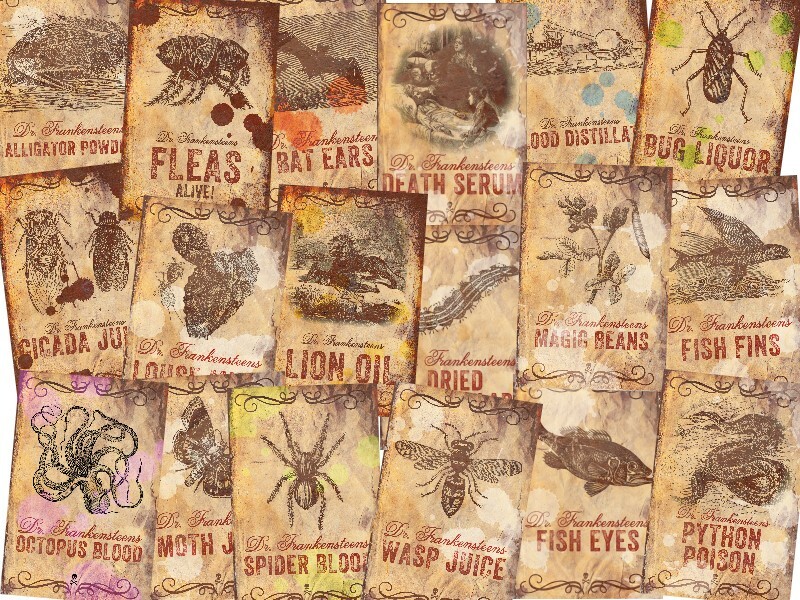 All labels are delivered in HQ PDF format (300dpi) with labels like "Death Serum", "Spider Blood", "Dried Caterpillars" and many more! Create your own mad lab by printing, cutting and sticking these labels onto old bottles and jars! 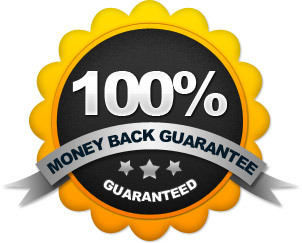 A number of web graphics for use on your website. 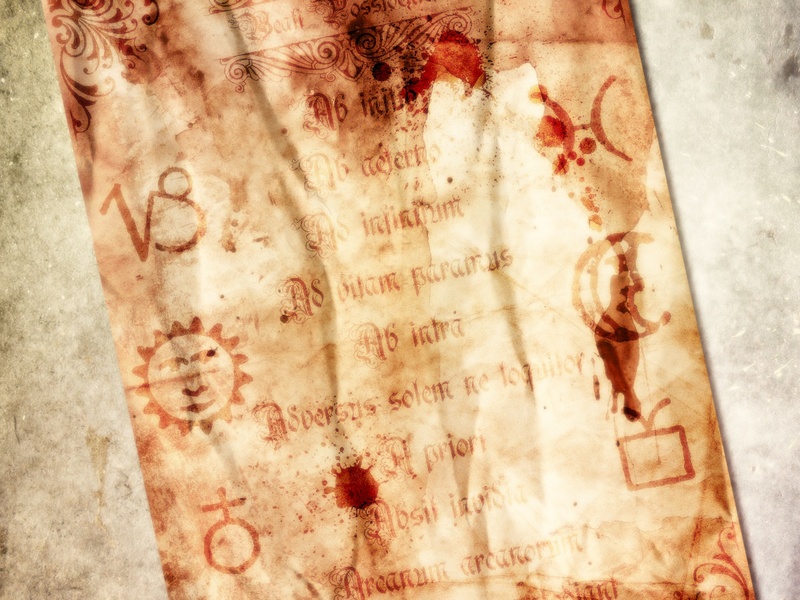 This mystic document is delivered in PDF format to print, cut and use as mysterious decoration for your Halloween party or haunt. Print as often as you like. 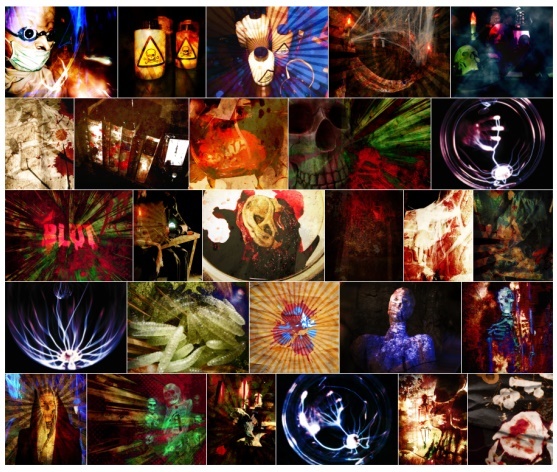 Many different horror-themed graphics in different resolutions perfect for your Halloween party invitations. More horror-themed graphics in different resolutions perfect for your Halloween party invitations. Assorted digital bottle labels for relabeling your bottles for use as cool Halloween decoration. Delivered in HQ PDF format to print as often as you like - time and time again!